Clinton, Michigan - Eden Organic Quinoa and Eden Organic Wild Berry Mix were chosen by nutritionists at Women's Health magazine for inclusion in their 2009 list of the Top 125 Best Packaged Foods For Women. Eden Quinoa was the top choice Quinoa in the Rice & Pasta category. Eden Wild Berry Mix was the top choice Fruit & Nut Mix in the Snack category. 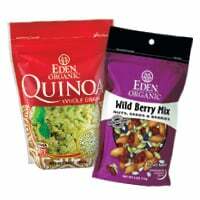 Women's Health said of Eden Organic Whole Grain Quinoa, "Tired of Rice? Try this hunger-killing supergrain," and of Eden Organic Wild Berry Mix - Nuts, Seeds & Berries, "This antioxidant powerhouse of raisins, cranberries, wild blueberries, almonds, and seeds is chewy, crunchy, and sweet." For the second consecutive year Women's Health sent a team of health and nutrition experts on an exhaustive mission combing the aisles of supermarkets examining and testing as many packaged foods as they could over four months. The team then selected and compiled a list of the best women's packaged food choices. Each food was rated for its health benefits, taste, and convenience. "Grocery shopping just got a whole lot easier! Our team of nutritionists tested aisles' worth of items for our annual roundup of the healthiest, tastiest, and most convenient supermarket finds," said Women's Health. The Top 125 Best Packaged Foods For Women list is a convenient and helpful guide to assist women in making quicker, healthier prepackaged food purchases. Eden Organic Quinoa is organically grown on small family plots at over 11,000 feet in the Andes Mountains. An ancient grain with pleasant texture, great flavor, potent nutrition, and convenience that cooks in just 12 minutes. Rich in healthy fiber providing 44 percent daily value (DV) per serving, and it provides complete protein with the best amino acids profile of any whole grain. Packed in convenient, protective, resealable 16 ounce standing pouches, and kosher pareve. Eden Organic Wild Berry Mix is a delicious, no salt added snack mix made of roasted organic almonds, roasted organic pumpkin seeds, and raw organic sunflower seeds mixed with organic raisins, organic dried wild low-bush blueberries, and organic dried cranberries. Rich and nutty with delightful tastes of sweet and mildly tangy dried fruit. It contains no refined sugars, refined oils, or sulfites. Rich in magnesium, a mineral women need more of. Packed in convenient, protective, resealable 4 ounce standing pouches, and kosher pareve.